You’re a well-informed parent, committed to raising a healthy family. You read food labels, give your kids vitamins. You enforce bedtime, check homework. You’ve had—or are planning to have—conversations with your kids about the dangers of alcohol and tobacco use. But are you planning to talk to your kids about dating abuse? A recent study by Liz Claiborne Inc. showed that parents are seriously out of touch with the realities of dating violence. The majority of parents surveyed couldn’t identify the warning signs of teen dating abuse. The majority of teens surveyed don’t confide in their parents about their abusive relationships. Sometimes teens themselves don’t know that they’re what they’re experiencing is wrong or where to get help. Isn’t it time to start talking? Liz Claiborne Inc.’s Moms and Dads for Education (MADE) to Stop Teen Dating Abuse is a coalition of parents, teachers and concerned citizens advocating that every high school in the country teach a curriculum on preventing dating relationship violence and abuse. MADE highlights: the power of education, the importance of reaching kids as they are beginning to engage in relationships and the potential for parental involvement to effect prevention. On Thursday, December 3rd, Liz Claiborne Inc. will host their 6th annual “It’s Time To Talk Day” at their New York City headquarters in partnership with Talk Radio News Service. Celebrities including Mariska Hargitay; Tim Gunn; Malaak Compton-Rock; Ann Shoket, Editor in Chief of Seventeen, and Stacy Morrison, Editor in Chief of Redbook; authors; corporate and government leaders will join with advocates, relationship and adolescent development experts, parents of victims, and teen survivors from across the country to get the conversation started. Leading local and national talk radio hosts will conduct interviews with these participants who are willing to speak-up about domestic violence and teen dating abuse. I'll be at the event as well--interviewing, blogging, tweeting--doing my part to keep the conversation flowing. As a parent, your support is invaluable in raising awareness on this issue. All of our children benefit from your involvement. By actively and vocally promoting healthy relationships, we can effect change. By starting the conversation, we can help stop the violence. Three-and-a-half years ago, a miracle happened. Eight pounds and two ounces of happiness pushed, struggled and ultimately, joyfully, screamed her way into my life. And since then, nothing has ever been the same. For every single one of the 49 pounds I gained to give her life, I am grateful. For every sleepless night, brought on by teething, illness or bad dreams, I am grateful. For every day that begins before the dawn, I am grateful. For every book read more than one dozen times, for every art project completed, for every Crayola design I have found on my furniture, I am grateful. For every hug, every snuggle, every tantrum, every tear, I am grateful. For every time I have held her sleeping body in my arms, I am deeply and humbly grateful. Little One, you have taught me more about what it is to love than you will ever know. Your very existence--the fact that you are--has transformed my life in ways you'll likely never understand until your own pushing, screaming, living bundle of love comes to be. It's you that I'm most grateful for, in every moment of every day. Thank you for being my child. Thank you, Sweet One, for being at all. By the very fact that you are, you have changed the world. And that is something for which to be abundantly, rejoicefully thankful. OK, I haven't actually tried this recipe yet (but I will tomorrow morning, part of my contribution to the Little One's preschool Thanksgiving feast). I got it from a Mama friend who happens to be a culinary genius. Seriously. The stuff that comes out of this woman's kitchen is out of this world. Boil the potatoes whole, with the skins on, until soft. (Cutting the potatoes before boiling can make the finished dish a little watery.) Strain potatoes, let cool, cut into equal parts to make mashing easier. Preheat oven to 350 degrees. In a large bowl or pot, put potatoes, softened butter, cream cheese, sour cream (and any of the add ins you're using, except the cheddar cheese). Mash, mash, mash, skins on and everything. (Electric beaters work best, but take care not to over beat.) Salt & pepper to taste. Spoon into a buttered baking dish (top with grated cheddar if you're using it) and bake for a half hour. UPDATE: I made this dish tonight, in preparation for the Little One's preschool Thanksgiving feast tomorrow and I'm happy to report that it's divine! One word of warning, however, you'll need to get your fork into the sink right quick after tasting because if you don't, you'll be in danger of eating half the dish! What do you get when you throw together an auditorium full of preschoolers; some thoughtful, absurdly addictive original tunes; and minimally animated stories of a little yellow visitor from the sun? You get one of those rare occurrences where you're actually having as much fun as your 3-year-old, even though you're doing the same thing. That's Gustafer Yellowgold. Thanks to some seriously hip friends, the Little One and I were introduced over the weekend to Gustafer, and his frighteningly talented creator, Morgan Taylor. Taylor is the illustrator/singer/songwriter behind Gustafer Yellowgold. And despite the slightly silly premise, Morgan's music is anything but fluff. There's no mistaking Taylor's musical aptitude or his flair for performance. In fact, it's impossible to listen to Gustafer's musical adventures without being reminded of another slightly silly musical quartet: The Beatles. (Who else but John, Paul, George and Ringo could have made a song about an Octopus's Garden sound so good?) Like the Beatles, Taylor brings a poetic sensibility to his music. And it's this poetry and intelligence that so much of today's children's music lacks. Taylor's brainchild, Gustafer Yellowgold, and the accompanying musical, multi-media adventures are the thinking parent's dream. So, if you don't know Gustafer yet, you can meet him here. Listen to his music, read his story, or pick up a DVD. And don't forget to check out the concert schedule. Because, like all good music, Gustafer is best experienced live. The elves are out in earnest now. (They have been since the day after Halloween.) And while I'm largely opposed to stretching the holiday season beyond its natural limits, for this particular gift item, I am happily making an exception. 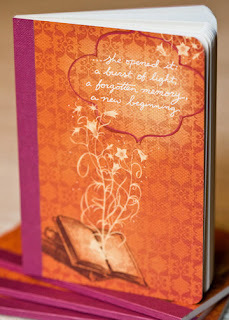 But their inspired journals offered at inspiring prices are not why I am making an exception to my rule. Compendium is also a generous supporter of my favorite non-profit, The Joyful Heart Foundation, created to heal, educate and empower survivors of sexual assault, domestic violence and child abuse and shed light into the darkness that surrounds these issues. In addition to the materials they donate to Joyful Heart retreats and other wellness programming, Compendium is currently offering a 30% discount off of your entire purchase to all Joyful Heart supporters. So if you're in the holiday shopping spirit and you're looking for gifts that say something special--something from the heart--then check out Compendium. Just enter promo code JOYFUL01 when prompted at the online checkout. Simple. While you're online, make sure you become a Facebook fan of the Joyful Heart Foundation. Thank them for setting you up with this discount, and for all of the unparalleled healing work they do. Talk about cause for celebration. And don't forget to spread the word. After all, the holidays are, um, just around the corner. Please get your face off the toilet seat. No, you can't put your tutu on the dog. Would you like it if someone stuck their finger up your nose? If you don't go back to sleep, we'll never have fun again. Ever. Get your hand out of your pants. Lots of changes are afoot in our lives. Some weigh heavily upon me. Others offer hope: a thin, bright line on the horizon. For me, all change is unsettling. Such is the nature of change, I guess. But her laughter--that full-bellied, joyful noise, utterly devoid of self-consciousness--was an affirmation. It sounded like a promise. It sounded like the future. Not in a trite way; the future always holds a balance of joy and suffering. But her euphoria echoing off our newly stripped Maples rang out like a shot--clear and strong. Its very utterance the proof of days to come. It is that future--the uncertain one--that promises. The Great Wide Open is exhilarating and terrifying. And we all have moments in our lives when we're able to see it--and how much we're at its mercy. But if we turn the prism just so, we can see the rainbow. Catching our breath and pulling golden Maple leaves from our hair, the Little One sat up and hugged me. It was one of those moments that's now burned forever in my memory, a snapshot of an emotion. Then she said, "Do we have to put all these leaves back in the trees?" I felt a stinging in the corners of my eyes and a smile erupt across my face. "Do you think we could?" I asked. "If we could fly, we could," she said. No sooner was Halloween in the coffin and buried than the stores began pumping the Christmas music in earnest. A quick trip to a kid's clothing store today made it clear what the next two months will bring: A Christmas cacophony, jingling it's way into our collective consciousness with a single, unified message. Buy, baby, buy. Look. I love this time of year. 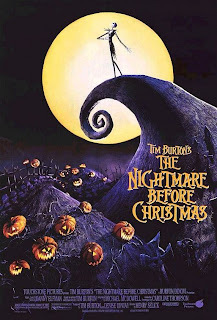 I love Halloween, Thanksgiving, Christmas. The leaves, the food, the parties, even the family. All of it makes for a festive, cozy end of the year. But Frank Sinatra's "12 Days of Christmas" at 10 AM the morning after Halloween? I'd barely made it through my latte and I find myself contending with Old Blue Eyes and his extended family. It's not right. We've all been battered by the economy over the last few years. Job losses, falling home values and vanishing 401ks have left us all a little spooked. The sum total of which amounts to people spending less. So, I get retailers encouraging us to look ahead to the inevitable season of buying giving, with the hope that we might loosen our purse strings sooner and more often. But I swear, if I have to hear Band Aid's "Do They Know It's Christmas" daily for the next two months, I'll be one wicked Grinch by December 25. To whom do I address my appeal? The Chamber of Commerce? The Better Business Bureau? Eight tiny reindeer? Stop the madness! Christmas is two blessed months away! I promise I won't forget to gift my kiddo, my parents, my brother, my nephew, my hairdresser and my garbage men. As for me, I can't think of a gift I'd appreciate more than allowing time to proceed along its own already absurdly rapid pace. Let's not fast forward our lives by foisting Frosty upon unsuspecting Mamas in early November. Father Time doesn't need the help. He moves pretty fast as it is, for an old guy. I've got a three-year-old to prove it.